Ms. Dunn earned her Bachelor of Science in Nursing from Mississippi University for Women. 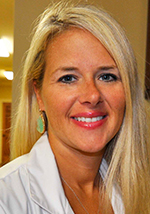 She furthered her education by receiving a Masters of Science in Nursing, Family Nurse Practitioner degree from Mississippi University for Women in 2009 and earned her certification through the ANCC. Before joining Nephrology Associates in May of 2015, Ms. Dunn provided her services as a Nurse Practitioner at Allegro Family Clinic and Golden Triangle Radiology Associates. Before earning her Nurse Practitioner certification, she worked as a Registered Nurse in the Critical Care Unit at Baptist Memorial Hospital-Golden Triangle for seven years. She provided her services as a Registered Nurse at the Oral and Facial Surgical Center in Columbus, Mississippi and the Mid-South Organ Transplant Foundation in Memphis, TN. Ms. Dunn is a member of Sigma Theta Tau International Nursing Honor Society, Mississippi Nurses Association, and American Association of Critical Care Nurses.